The Bible contains vast and varied portraits of God's multifaceted mercy. In his typical style Kilian McDonnell's latest collection of poems reveals a lifetime of contemplating biblical characters and their experience of the tenacious mercy of the Sovereign God. What might the Prodigal Son have been rehearsing on his way back home to his father? Did the disciples think Jesus was "teasing" them when he asked them to feed the five thousand? Imagine Mary trying to explain her "bulging belly" to her mother. How are we to understand God's mercy in the turmoil brought about by the birth order of Esau and Jacob? Where was mercy for Jesus on the cross? "Dark Night of the Heart" explores the question of the apparent absence of God's mercy. Enter the drama and amazement of the first miracle at Cana and Jesus' pursuit of wild, ornery fishermen after a long day at sea. Kilian McDonnell, OSB, is a monk/theologian of Saint John's Abbey, Collegeville, Minnesota. He is the author of four books of poetry: Swift, Lord, You Are Not; Yahweh's Other Shoe; God Drops and Loses Things; and Wrestling with God (all from Saint John's University Press). In his inimitable style, Kilian brings biblical characters and his fellow monks to life in poetic vignettes without airbrushing their flawed humanity. In this, he has no peer. Not even God always escapes the candor Kilian brings to his perceptions. With a mere phrase or short sentence he gives readers an amazing sensory feel for the realism of personages and their environments. 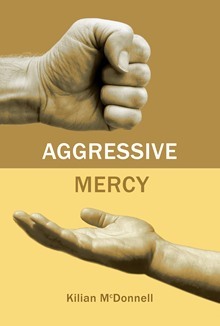 Father Kilian McDonnell's new book of collected poems has the right title-Aggressive Mercy. . . . There is no room for a doubt in these poems that we humans are inclined to "minor treacheries" and "small mess[es]." We make "unbalanced vows" which mysteriously bind the Lord "while we are free / to plunge a dagger / into the heart of Love." . . . Throughout these searching poems, Father Kilian wonders about "the difference / between living / in God's glory / and walking / in God's shadow." Aggressive Mercy is an unapologetic inquisition of Scripture, God, and humanity. Kilian McDonnell pits his unparalleled knowledge of our biblical heritage against tough questions and painful truths, teaching us that questions and doubts are, in fact, the birthplace of faith. Beautifully lyric, unwaveringly honest, and immeasurably brave, this collection gives us the gift of a new way to read our history and ourselves.